Note: My NDA work (majority) does not appear in my portfolio. 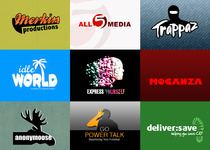 Highly polished forward-thinking graphic design, illustration and web design for online content, film and all online media. 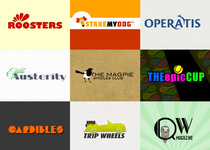 Based in Manchester, UK I turned full-time freelance in Nov 2010 having gained a great deal of experience over a number of years designing for various corporations. 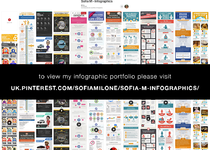 I am currently building my personal, non-corporate portfolio (a lot of work I do is under NDA which makes this hard to showcase). I have a very broad range of clients in industries I am now very familiar with including but not limited to: food and drink, online gaming, book publishing, magazines and journalism, fashion and retail, tourism, car hire, music and film, education, charities, sports clubs, health and social care, recruitment, fraud protection, the service industry, and generally working with a lot of new media and connectivity within. 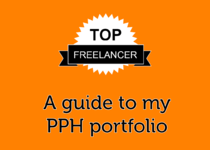 I am now heavily involved in a lot of large scale work, including charity projects, and I am project managing a few larger ventures thanks to PPH. If I have made a proposal on your project it is because it must have sparked some genuine interest. If you are inviting me to make a proposal please ensure you have looked through my portfolio, and do not ask me to send you examples of my work unless there is something specific you'd like to see that isn't present. My design styles are as broad as my client base, from typical hard hitting, sound, clear and concise business branding, to more stylised, and fluid hand drawn or illustrated work. I relish working to a deadline, and although I often work to very specific criteria, some clients are looking for a moment of inspiration, and that's where I excel. I'm always ready for a challenge, and providing the brief is concise and well-conceived I can produce work to a very tight schedule. If you are online, you will see amendments almost immediately. Please note that I am aware people have been stealing my bio here for their own use, so if you are reading this, and you're not looking at the designer Sofia M on PeoplePerHour, then this biography has been stolen. Also, if the freelancer is happy to do that, it's possible they also stole my artwork to boot. 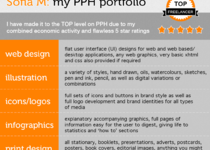 I also design websites, and for more complicated sites I work with a very experienced back end coder. Note: I no longer take on coding work. Film/Video Editing, Closed Caption Subtitle Production (English only). Education Summary: I have not formally trained in any of the skills I have acquired over the last fifteen years to do the now many varied jobs I find myself undertaking. All my experience has come from working and learning on the job. Thus I have a great ability to think beyond usual constraints, and not be limited by any software or perceived convention. I have been a writer, a musician, and actor; a stage manager, a landscape gardener; I have worked in retail management, pottery, and equestrian sports. I have been stuck in offices, and out in the field. 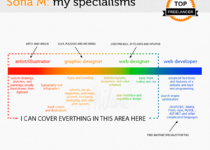 In short, I have a very long portfolio career that I know adds to my skill, and mindset in any given field of expertise, and thus informs my work in a way that training as a graphic designer and living in a design house for ten years could not possibly afford. A great working experience with Sofia. Highly recommended for design, initiation of improvements, availability and cler communiaion. 5 starts. 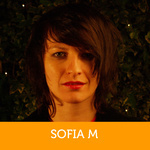 Sofia was great to work with and produced some excellent work for us. She was very responsive and was on-hand to fire over amends quickly. Sofia has been asking TONS of questions from the start which really pushed her forward compared to other proposals. She really took the time to read, understand and reply to my REALLY LONG emails and REALLY LONG brief. Sofia also replied to my messages during a weekend and pushed other work to the side when she really didn't have to. I can't put into words how much I appreciate this. Excellent work with very fast turnaround. Great work. Sofia has gone above and beyond to help me out on this job. Sofia made an excellent corporate video for us. We are so pleased! Very quick, very responsive. I will definitely work with Sophia again. Sofia did another great job and is a pleasure to work with. I can definitely recommend her. Sofia did an efficient job and met the deadline.